Erie, PA (January 18, 2018) – On Tuesday, January 16, 2018, at a gathering of the Howard Hanna Southwest/Sterrettania office at the Erie Yacht Club, President of Howard Hanna Pennsylvania Tom Ceponis was joined by Vice President & Regional Manager Bebe English, Howard Hanna Mortgage Regional Manager Peter Bauer, Barristers Title Vice President and General Manager Cathy Hopkins, Barristers Title General Counsel Emily Fullerton, Esq., and Erie managers to announce Renee Brown-Wagner as the new Sales Director of the Southwest/Sterrettania office. Howard Hanna Real Estate Services ranks as the #1 home seller in Erie with a 28.48% market share of homes sold in 2017. The nearest competitor’s market share was 16.19%. “With Renee’s knowledge of the real estate transaction and of the homes in the Erie market, she will continue be a great resource for the office in her new role, and helpful in leading our agents to great successes in 2018 and beyond,” said Ceponis. 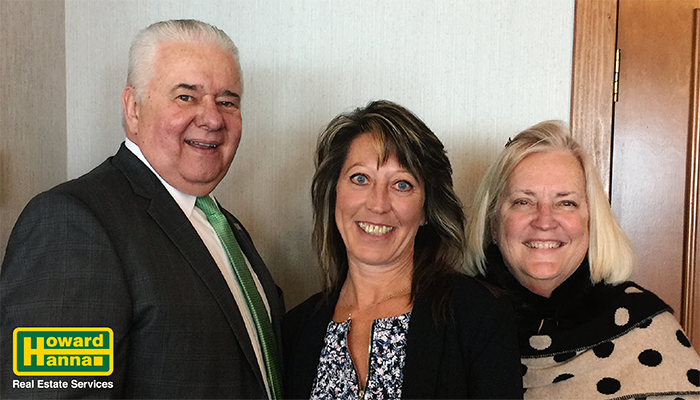 Pictured L to R: Howard Hanna PA President Tom Ceponis, Renee Brown-Wagner and VP/Regional Manager Bebe English.